Taking a break from shooting, Megastar Chiranjeevi went on a vacation to Japan with his family. While returning back to India at Kyoto airport, Chiru ran into Bollywood superstar Aamir Khan. It seems like the duo had chitchat and discussed their upcoming projects. “Ran into one of my favorite actors, Superstar Chiranjeevi Garu at Kyoto airport! What a pleasant surprise. Discussed his new project about freedom fighter Uyyalawada Narasimha Reddy. You are always such an inspiration sir” captioned Aamir Khan posting the picture in which both are seen all smiles. The pic is going viral on the internet and the fans are super happy to see the two stars bonding with each other. Some are even expressing their opinions that the duo superstars should do a multistarrer together. 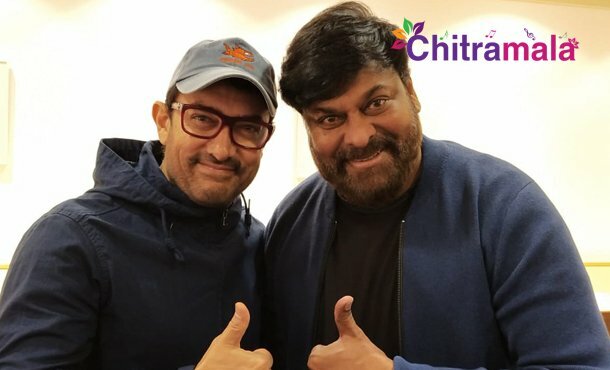 On the professional front, Chiru is busy with the back to back shooting schedules of his upcoming flick ‘Sye Raa’ and Aamir Khan is preparing for his role in ‘Lal Singh Chadda’ which is based on ‘Forrest Gump’ and Aamir is on a mission to lose at least 10 kilos for his role.